Los Angeles, CA – Though most known for his soulful songwriting and gentle croon as heard on blockbuster hits such as “Strawberry Letter 23” and “Inspiration Information,” Shuggie Otis has long been held as one of the most innovative and tasteful guitarists to ever pick up the 6-strings, the “heir to Hendrix” as he is often called. A guitar-playing prodigy from an early age, Shuggie performed on stage and in the studio alongside his legendary father, bluesman Johnny Otis. Now, Shuggie has a new project that showcases just how mindblowing he can be on the pearly frets of his gorgeous maroon Gibson SG, an adventurous new fusion rock project called Inter-Fusion. The album consists of mostly instrumental tracks that groove and weave, taking unexpected turns in surprising directions but all anchored by one of the finest rhythm sections imaginable featuring drummer Carmine Appice (of Vanilla Fudge and Beck, Bogert & Appice) and bass player Tony Franklin (of The Firm and Roy Harper). In addition, keyboardist Kyle Hamood (of local L.A. rockers Them Guns) steps in as both a musician and producer of the album bringing the absolute best performances possible out of each player. 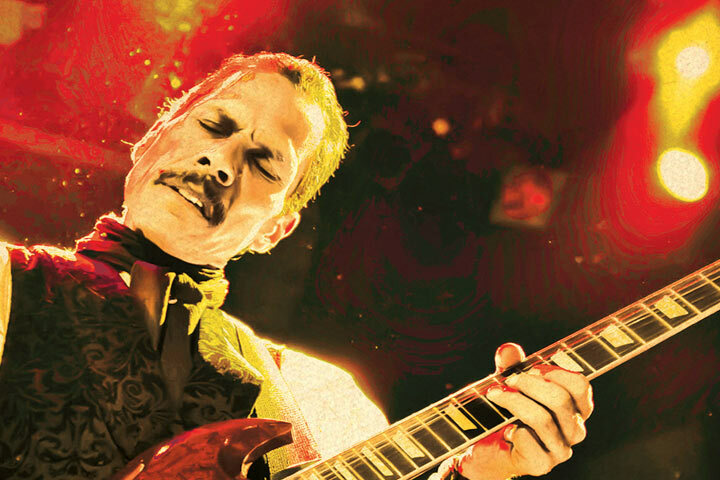 Los Angeles, CA – After the recent release of his first-ever live album, Live In Williamsburg (available on CD, vinyl and DVD), R&B legend Shuggie Otis is once again bringing his talents to the stage for a 20+ date, coast-to-coast tour starting July 5th. Nobody brings as much soul, style, and swagger to a live performance as Shug with his signature red Gibson SG, and fans who have followed this multi-talented performer’s tumultuous career know that a Shuggie Otis concert is not an event to be missed. Whether it be the fabulous grooves of “Inspiration Information” or the funkdafied rhythm of the all-time classic “Strawberry Letter 23,” Shuggie’s songs have a magical sway over audiences, both young and old, guaranteed to get them on their feet and dancing in the aisles! The son of renowned bandleader and musician Johnny Otis, Shuggie Otis began his incredible career at the tender age of 15, playing as a session guitarist alongside Al Kooper before releasing his first solo album Here Comes Shuggie Otis in 1970. Already being hailed as a uniquely skillful guitarist, Shuggie proved his mettle as a songwriter the following year with the hit single “Strawberry Letter 23” from his second solo album. Now one of the most sampled songs in all of modern music, “Strawberry Letter 23” became an even bigger smash when The Brothers Johnson recorded their version in 1977 (produced by Quincy Jones). After the release of his third album Inspiration Information failed to meet outsized expectations, Shuggie seemed to retire permanently from music. But, thankfully, he reemerged in 2013 with a deluxe reissue of Inspiration Information that included a new album of previously unreleased recordings called Wings Of Love. Since then, Shuggie has returned to the stage and been re-embraced by an adoring public who have waited a long time and never lost faith!